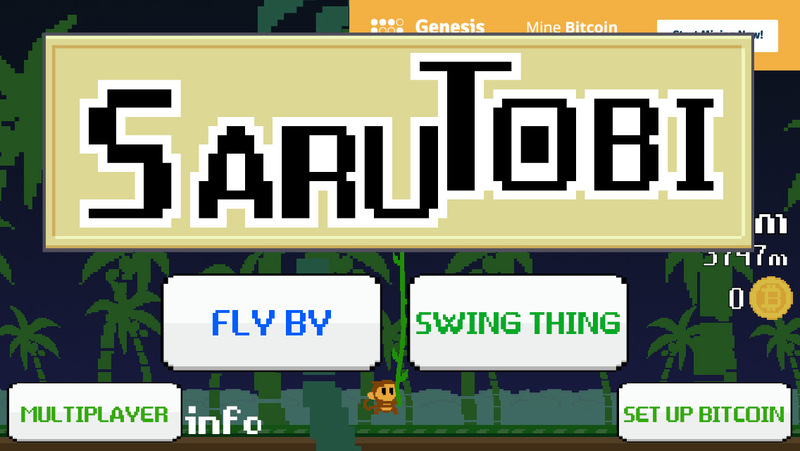 SaruTobi is a free mobile game for Apple’s iOS devices such as iPhone or the iPad (not yet available for Android devices) that utilizes a simple yet fun and an addictive concept and comes with a Bitcoin theme. You essentially play a monkey called Tobi and there are two modes that you can choose between – either swing your character on his vine to build up momentum and then release him to fly, or swing and jump from vine to vine. In both modes you collect some coins that are called guess how – Bitcoins, but these are only in-game coins and not real Bitcoins. You can use these Bitcoins in-game to purchase some power ups to help you and add some fun while you play, and then there are other coins called Black Coins that you can also collect while you play. These coins can be redeemed for actual Bitcoin Tips, once you have collected at least 12 Black coins you can exchange them for a Bitcoin tip that will be sent to your Bitcoin wallet (you need to enter the address inside the game) and you can also use an email that is registered as a Xapo online Bitcoin wallet as the game apparently has an integrations with that service as well. Sarutobi is actually the first game for the iOS platform to actually have a feature that rewards players with actual Bitcoins for playing the game, unlike for example the game Bitcoin Billionaire that we have reviewed a while ago. Now, don’t expect too much, you will not get rich playing SaruTobi and earning Bitcoin Tips as a reward, what you are going to get is equivalent to just a few cents. When trying out the game we have concluded that it takes about 15-20 minutes of game play to gather 12 Black Coins that can be redeemed for Bitcoin Tips. The tips you can expect to get are something in the range of between 50 bits and 120 bits, or at least we’ve seen such a rewards so far (5000 to 12000 satoshi). 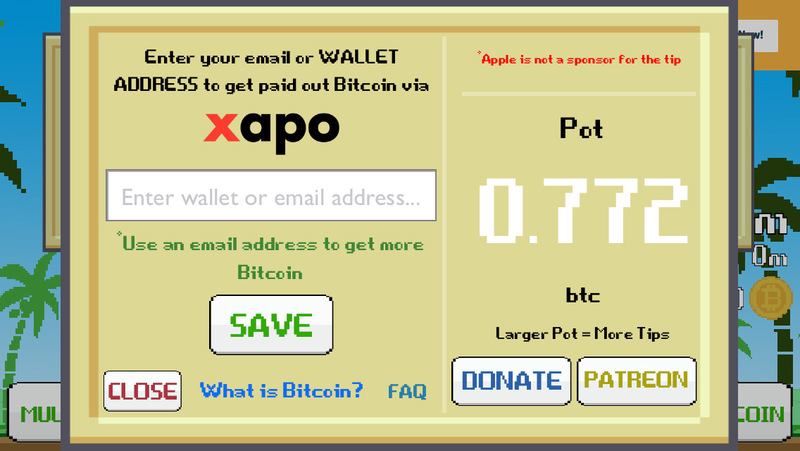 On the other hand this is much better than what many free Bitcoin faucets give you and with SaruTobi you get to have some fun playing an actual game, ideal for wasting some free time. 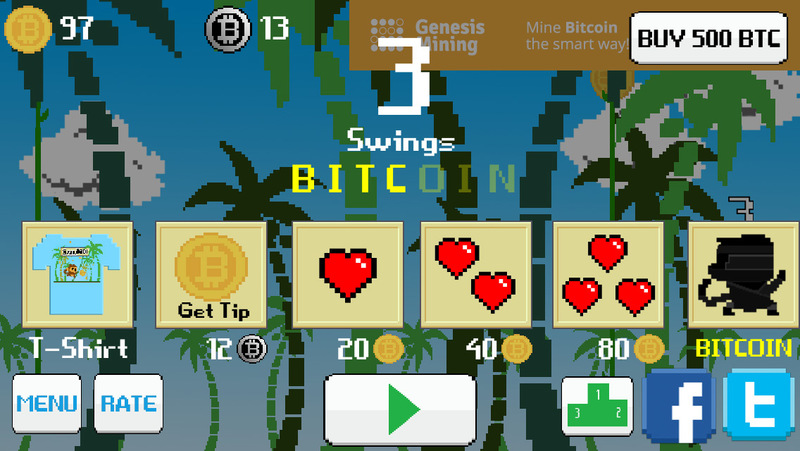 While playing SaruTobi you can also purchase some in-game content, namely in-game Bitcoins (not real ones) with the cash spent for these going for the Bitcoin Tips that you actually get rewarded with. The rewards wallet also gets filled in from donations and advertisements, though the only advertisement you are going to see for the moment is that of Genesis Mining who have apparently donated 15 THS of Bitcoin cloud mining hashrate to mine directly to the game’s rewards wallet. If you are interested you are welcome to check out the game yourself, but a bit of warning – we already mentioned that it is a fun and an addictive game, so be careful and don’t spend too much time on it!